Use this FREE guide to figure out how much your time is worth. Freelance web designer and freelance web developer careers have a lot of perks—you get to be your own boss, accept jobs on your terms, and maintain control over your creative vision. But, when you’re building a career as a web designer or web developer, that also means it’s entirely up to you to decide how much to charge for your services. While this might come naturally to some lucky folks, for many people the business side of creative work can be intimidating. I mean, how much CAN you ask? And what formula should you use to determine your freelance web developer or web designer rate? Chapter 4: Rate Models—Flat or Adjustable? Per Hour or Per Project? 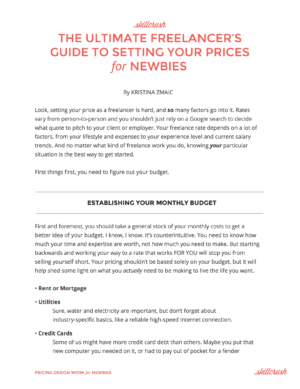 Chapter 5: When You Outgrow Your Rates, Change Them! 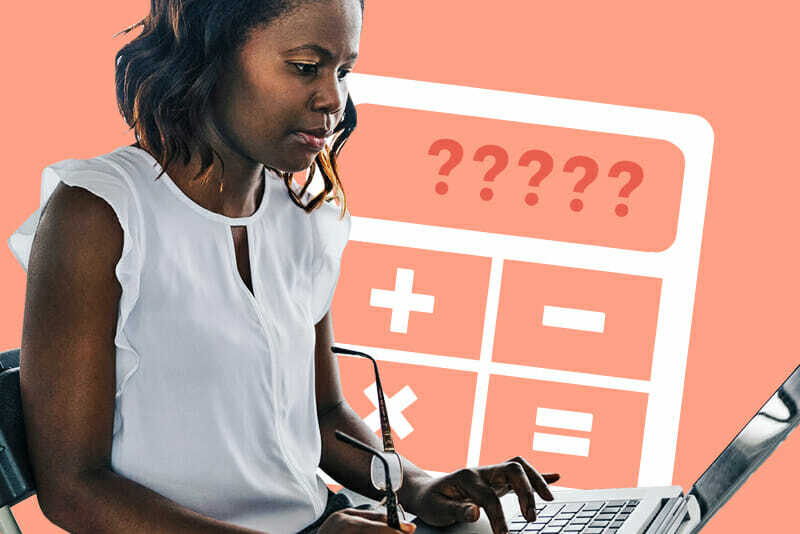 When it comes to the nuts and bolts of freelance rate calculation, a good place to start is with our own Skillcrush method. Start off by researching hourly rates—look at design communities, developer forums, freelance sites and job boards, and other freelancers who do similar work to get a sense of rates. Use the Bonsai Freelance Rate Explorer—this web tool allows you to gauge where the freelance web developer or web designer rate you have in mind compares to others around you. Then take your proposed rate, multiply it by the number of hours you plan to work in a week and the number weeks you plan to work in a year, and you’ll land on your estimated annual income. Still, while those are the basics, the process of hitting a perfect rate is a little more nuanced than that. In order to get a better idea of the deeper ins and outs of establishing a freelance rate for web design or web developer work, I went straight to the source and asked two freelance web professionals. Here’s what they had to say. 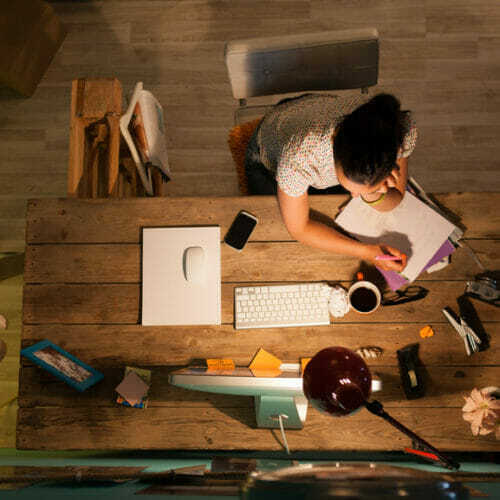 One of the first things to do when establishing a fee for freelance work is to take stock of your living and business expenses and determine how much income you’ll need to stay ahead financially. Nela Dunato has worked as a freelance web designer since 2013, and she says that before she made the jump to freelance work she spent several years tracking expenses like taxes, healthcare, and equipment costs (and how much of her salary went toward them), giving her a good idea of what kind of expenditures to predict moving forward. This allowed her to calculate how much income she would need to cover the basics, as well as how much she would need for some fun and savings. But what if you haven’t spent the last few years keeping meticulous track of your income and expenses? No problem—simply change your ways starting today. If you’re currently a full-time employee at a company or agency, take this opportunity to get organized, bust open Excel, and start creating a baseline you can use to establish a fee that meets your needs. It’s also helpful to remember that becoming a freelancer doesn’t have to start off as an all-or-nothing proposition—you can take freelance jobs to test the fee waters while still working in a field or job you’re hoping to transition out of. Lisa Webster, a freelance web designer and Senior Graphic Designer at financial services company MX, says during her early forays into freelance work she tried to match the hourly rate she made at her beginning design jobs (and the same approach can be used for web development). However, Webster adds that in those early days she always maintained regular design employment (both part-time and full-time) in order to keep a steady, predictable income flow while she found her way with freelance work. So how long should it take to find your own way, and how do you know when you’ve gotten there? Dunato says that—after a process of trial and error—she arrived at her first optimal fee after about two years of freelance work experience. Dunato says she continued to adjust her prices slowly as she gained more real-world experience until she finally hit pricing that was in line with the amount of work she was putting into design projects. Webster says getting where she wanted to be fee-wise was a multi-year process for her as well. It was something she knew she’d accomplished when she started successfully charging fees similar to what an agency had been charging their clients for her hourly work. Webster credits the design portfolio she was able to build while working for agencies as her path to reaching the freelance fee she wanted—by taking her experience into the freelance sphere, she started landing bigger and better clients and was able to bring her agency rate with her. But what if you’re a web developer and not a designer? No problem—the approach remains generally the same. All of the above calculation advice, tips for factoring in incidental expenses, and strategies for adjusting your approach as your business grows can also be applied to web development. The main differences are in where to look for comps and how to present your work to potential clients. Instead of hanging out on sites like Dribbble and Behance to get a sense of what other freelancers are doing, you’ll want to check in on developer forums like Github and Stack Overflow. And instead of creating a dazzling design portfolio to land more clients and up your rates, you’ll be tweaking your approach to be developer portfolio-specific (and again, posting your work on forums like Github). Two important things to consider when calculating your freelance web developer or web designer work rate is whether your fee should stay flat or be adjustable based on job-specifics, and whether you should charge for billable hours or base your pricing on each overall project. It turns out, it really depends on your own work style and client base. Dunato charges per-project and bases her price on the amount of work involved. “I’ll charge more if the job includes strategy, consulting, or managing other people,” Dunato says. As for choosing to charge per-project versus billable hours, Dunato says it’s less risky for the client. On the other hand, Webster maintains a relatively consistent rate and charges per hour (though she does modify her standard rate and offers a higher “rush rate” in cases where potential clients want projects done in a shorter time than she initially quotes them). Regarding her decision to use billable hours rather than charge per project, Webster says the hourly approach makes more sense for her since they are so many unexpected turns in a design project. “I’ve worked with too many entrepreneurs who keep adding changes that affect the entire design,” Webster says. “This can result in hours of extra work that wouldn’t have been anticipated if you charged them per project.” Webster says that charging per hour protects her from having to either eat the cost of all those extra hours. While it can take a few years to reach a rate that really fits you, there will inevitably be a time when you outgrow that first optimal rate. But what’s the best way to recognize if it’s time to make a rate change? For Webster, it’s about the quality you can produce and convey through your portfolio. “People will judge you based on your skills and what you can deliver rather than by reading through a resume of your experiences,” Webster says. She adds that two years ago she raised her rate based solely on a portfolio update that included new higher quality designs and projects than what she’d produced previously—it’s important to remember that a design career will always be an evolution of skills, and your rates should reflect that growth. To close, while there’s no magic formula or perfect road map to establishing your own freelance design rates, there are some basic guidelines to follow to pin down a rate that fits your unique needs and skill level. By using the market as a comparison point, monitoring your living and business expenses, allowing yourself time to optimize your rate, and picking a fee model that fits your work style, and you’ll be well on your way to establishing your own perfect freelance rate. Meanwhile, be sure to download our free and easy to follow price setting guide from the form below. And if you’re ready to start learning the skills it takes to embark on your own career as a freelance web developer or web designer, look no further than our Skillcrush Web Developer, Front End Developer, and Web Designer Blueprints—online courses designed to be completed in 30 days by spending just an hour a day on materials. Currently it seems like Drupal is the top blogging platform available right now. (from what I’ve read) Is that what you’re using on your blog? This is a topic that is near to my heart… Cheers! Where are your contact details though? Hello there! I could have sworn I’ve been to this blog before but after looking at some of the posts I realized it’s new to me. Anyways, I’m definitely pleased I found it and I’ll be book-marking it and checking back often! Oh my goodness! Awesome article dude! Thank you, However I am encountering issues with your RSS. I don’t understand the reason why I can’t subscribe to it. Is there anyone else having identical RSS issues? Anyone that knows the solution will you kindly respond? Thanx!! Thanks for Sharing your Valuable information. This is very correct. It’s good to see someone with great ideas about this. There are a lot of people in the web spreading incorrect info about these stuffs. Thank you so much for posting it here. This is very correct. It’s nice to see some people with great ideas about this. There are a lot of people out there giving incorrect info about these stuffs. Thank you so much for posting it here. This is very correct. It’s nice to see someone with great knowledge about this. There are so many people in the web giving incorrect info about these stuffs. Thank you so much for posting it here. Thanks for your blog post. Some tips i would like to bring up is that personal computer memory is required to be purchased if your computer can’t cope with that which you do by using it. One can set up two random access memory boards having 1GB each, for instance, but not certainly one of 1GB and one having 2GB. One should make sure the manufacturer’s documentation for one’s PC to be certain what type of memory is necessary. Spot on with this write-up, I honestly believe that this site needs much more attention. I’ll probably be returning to read through more, thanks for the info! Thanks for the suggestions you have provided here. Something else I would like to state is that computer system memory demands generally rise along with other improvements in the technological know-how. For instance, whenever new generations of cpus are brought to the market, there’s usually an equivalent increase in the size calls for of all laptop or computer memory in addition to hard drive space. This is because the application operated by way of these cpus will inevitably surge in power to make new engineering. Interesting blog post. The things i would like to make contributions about is that laptop memory should be purchased if your computer can’t cope with anything you do along with it. One can set up two RAM boards with 1GB each, for example, but not certainly one of 1GB and one with 2GB. One should always check the car maker’s documentation for one’s PC to ensure what type of memory space it can take. The Nectarine has smooth-slick pores and skin like a Plum. The flavor is resembling a Peach. The significant distinction is that the Peach has a rough protective skin a prickly fiber that protects the fruit and if not wiped-off can damage your tongue…. Your blog is amazing dude, i love to visit it everyday. very nice layout and content . We stumbled over here by a different web page and thought I should check things out. I like what I see so now i’m following you. Look forward to checking out your web page again. A person produced a few nice points presently there. Used to do searching on the matter and discovered practically just about all people goes along with along with your blog. I do believe all the ideas you’ve offered on your post. They’re very convincing and will definitely work. Still, the posts are too quick for beginners. May you please lengthen them a bit from subsequent time? Thank you for the post. Heya i’m for the first time here. I found this board and I in finding It truly useful & it helped me out much. I am hoping to give one thing back and help others like you aided me. Hi, just came across this web page. Its a fantastic illustration of how small to medium sized companies can use Awards based marketing to get their companies recognised on the 1st page of Google. Awards programmes offer many benefits to participants. After all they bring recognition and you can share the news of your win with your employees, clients, industry peers and target market as much as you like. Additonally awards offer prestige and status, giving potential prospects peace of mind that they are working with a reputable company. There are many types of awards programmes, including those that host awards ceremonies (and you pay per table), organisations that award only their members (and you pay for membership and advertising) and those that provide marketing materials. The latter is a great choice for those who are wary about the benefits of using corporate awards programmes because generally nominees and winners do not have to pay a penny to be considered. Participants often receives online exposure, usually with a reach much greater than their own marketing efforts can offer. Other free benefits can include the use of an press release. Most participants have the option to purchase additional marketing materials to further promote their win, if they wish to, for use in social media campaigns, on their own website, email marketing campaigns or in customer newsletters. Good – I should definitely pronounce, impressed with your website. I had no trouble navigating through all the tabs as well as related information ended up being truly easy to do to access. I recently found what I hoped for before you know it in the least. Reasonably unusual. Is likely to appreciate it for those who add forums or something, web site theme . a tones way for your customer to communicate. Nice task.. This sounds like a fantastic tool! I always buy domains for my affiliate links so there’s no chance of anyone stealing my links! But I will definitely look into this, thanks! What’s up, all is going fine here and ofcourse every one is sharing facts, that’s in fact excellent, keep up writing. Amazing Job! Thank you for sharing. Hi, nice post i’m very enjoy reading it, thumbs up! Atendemos inmediatamente las llamadas de los clientes realizando un servicio de calidad a domicilio, puede llamarnos las 24 horas escribirnos a través del formulario de la web aquí, Déjenos su teléfono de contacto, describa la avería de su electrodoméstico, inmediatamente le llamamos para resolver su avería en el menor tiempo factible. Observe que cierren bien las puertas y las juntas de gomas para un mejor aprovechamiento del frío. Si existe una pérdida de gas evalue el estado de su refrigerador antes de reparar. Además me añade que no hay servicio técnico de Fujitsu en Zaragoza… genial, por eso nadie cogía el teléfono. During the process of choosing a set of typefaces, you should start exploring what colours you will use in the interface, backgrounds and text. I recommend a limited set of colours and tones for the general UI. When proposing an interactive concept or a design ‘look and feel’, you need to ensure that you and the client both get on the same page as soon as possible. Avoid spending too much time on a concept before sharing it with the client. Think about the most simple layout you can imagine for a simple purpose, and start adding components that are necessary. In the end you’ll be surprised how hard is to keep it simple. It’s important to apply those consistently across the website layout, depending on each element’s functionality. Think about the layout of sites like Facebook, Twitter, Quora and Vimeo. Besides the UI there shouldn’t be any colour restriction for illustrations or graphic details, as long as they don’t interfere with the functionality of the components. When I’m asked to create a look and feel for a website layout, the first thing I do is to come up with a top-level framework that solves all the design problems. The framework is the UI that surrounds the content and helps the user perform actions and navigate through it. It includes the navigation and components like sidebars and bottom bars. oh cool, this information is really useful and definately is comment worthy! hehe. I’ll see if I can try to use some of this information for my own blog. Thanks! for it. Take a news site for example. What’s the goal? Is it to make make as many ad impressions as possible or is it to provide the best reading experience? As everyone knows though it’s not really about how good the movie was, it’s about if you would watch it a second time? At the same time, web design is one of the most important factors for the success of a website. In fact, almost half of people say that the design of a site is their main factor for judging a company’s credibility. As a consequence, it also influences conversions, bounce rate, and more. Your post captures the issue peylfcter! Haeallujlh! I needed this-you’re my savior. Leí que en el caso de no disponer de los discos de recuperación, podía reinstalar desde la partición oculta mediante una combinación de teclas al inicio del arranque. Parecía que iba bien, todo mucho más rápido y al cabo de 20 minutos, después de reiniciarse el sistema, el portátil quedó en el mismo punto. He llamado al servicio técnico de SONY más cercano y me han dicho lo mismo que al compañero que posteó al principio. El servicio es el peor que he visto hasta ahora, soy de Uruguay y me compraron una en Panama la cual me vino con las teclas falladas, fui al local de sony a reclamar dicen que si es comprada en otro país no sirve la garantía. You have brought up a very great details, thanks for the post. Hi there, You have performed a great job. I’ll certainly digg it and individually recommend to my friends. I am sure they’ll be benefited from this web site. I was recommended this website by my cousin. I’m not sure whether this post is written by him as nobody else know such detailed about my trouble. You are incredible! Thanks! Hi there! I could have sworn I’ve been to this site before but after checking through some of the post I realized it’s new to me. Anyhow, I’m definitely delighted I found it and I’ll be book-marking and checking back often! It’s perfect time to make some plans for the future and it’s time to be happy. I’ve read this post and if I could I wish to counsel you some attention-grabbing things or suggestions. Perhaps you can write next articles referring to this article. I want to learn even more issues about it! In awe of that anrsew! Really cool! While we are specialist in affordable, fixed price websites, we can also develop more bespoke solutions for those that need some added functionality or features. Please contact us to discuss your individual requirement and we can tell you just how we can help or view some examples of our bespoke development. What a joy to find such clear thgnkini. Thanks for posting! WONDERFUL Post.thanks for share..more wait .. ;) ? Exceptionally decent post. I just unearthed your weblog and needed to state that I’ve truly appreciated surfing around your blog entries. After all I’ll be buying in to your feed and I trust you compose again soon! Wonderful cases. Extraordinary article. A debt of gratitude is in order for sharing this data. Just wish to say your information is as amazing. you are an expert on this subject. Yup, that sholud defo do the trick! I would proceed with caution when considering these rates from a website (njcreatives.org) that hasn’t updated their copyright date to 2017 yet. The article information is apparently outdated. I have a 1st class degree in software engineering, 10 years industry experience mostly midle-ware, low level server applications and mobile applications (Symbian). Since then I spent a number of years on a PhD and gained and maintained software development skills but left (ABT) due to ill health I now work for myself. My current primary skills / expertise are Android, Java, Spring MVC, Java Server Pages, MS SQL and proper relational database design. I tend to play down / not get over well my skills face to face. I understand the difference between web application developer and a web designer and so I would never say I was a skilled web designer and have steered clear of this work. On the other have I know people who have had nothing to do with software development, picked up WordPress 6 months ago and now call themselves an expert web designer! … knowing I am not an experienced web designer, completely up front and with their preferences we/I selected a quality HTML5 CSS template, I adjusted some of the colors and adapted it into a set of Java Server Pages. I am now in a position to provide content and literally ANY back end functionality they want. I am doing this as a gift (possible donation) and I am adding functionality they may not want that I can switch out but may be useful later. It seems to be working well. Thing is how do I market this skill set when saying I can “do web sites”. How do I get over how I am different to the 6 months gift of the gab WordPress guy, while being honest about where my skill set is and what it can do for them. What do I charge? One thought is to build a dummy web site with loads of great usable functionality and use that as a show case. Also to keep doing stuff and get known. You could do that, I have seen others use a portfolio or “showcase” website before. It isn’t uncommon. However the problem here is that most companies only want to pay for what they need and the skill-set you have (while very impressive and it makes me jealous) may not be relevant to them until it is convenient for them. Once it becomes convenient for them you can bet they wont want to pay more for it. Unfortunately many business owners have the mentality of “just do what I tell you to get done and don’t give me a bunch of extra crap” because generally that means they don’t get pressured into paying for more and they know for sure they are getting what they are asking for. This is an unfair standard for them to have as it makes it hard for anyone to advance when they are asking for basic level content but you have a much larger potential skill-set. Super jazzed about getting that knoowhw-. Hi! I’m a WP and from-scratch web designer. Let me know if you’d like to work together on a project. of writing here at this web site, I have read all that, so now me also commenting at this place. I find out many superb information below. Undoubtedly value social bookmarking regarding returning to.. Here I’m wondering simply how much effort you put to make this kind of amazing educational internet site. Great and a very useful blog for me. Keep sharing. You have done an excellent post . You are well-done for shared . That really caruptes the spirit of it. Thanks for posting. Hello, i believe that i noticed you visited my weblog thus i got here to return the prefer?.I am trying to to find things to enhance my site!I suppose its good enough to make use of some of your concepts!! Wow, fantastic weblog structure! How long have you been blogging for? you made blogging look easy. The overall glance of your site is wonderful, as well as the content material! This piece was a liefjacket that saved me from drowning. Don’t forget about paying office expenses and Uncle Sam. As a freelancer you have to pay as both the employee and the employer. So “$55/hour X 1,000 hours = annual income of $55,000” isn’t as simple as if you were getting a W2 as a regular employee. You are paying about twice the taxes as normal. You will also have operating expenses that you will need to cover, since you are working for yourself. I normally figure out what I want my net income to be, then up that by 40%. Trust me, the first time you fill out a schedule C, you will be happy you did, because that first giant check you have to write to the IRS hurts if you didn’t expect it. Thank you for these guidelines. Man you said it. I had to learn this the hard way. I normally charge by the hour, that way I don’t get bombarded with ridiculous corrections and suggestions by the clients because they’re more careful when they know it will cost them more. I read all of your information from this blog, really affordable information which helps people to learn new topic. By the way, Graphics design is a part of web design, it will be more batter if you focus on this design also. This is a very great article. Thanks a lot for sharing the post.! This is a great article, however I tend to charge by project because not every project is the same. I recommend that you charge what you feel you are worth as well as what you are offering. A real developer is not just a Web designer in order to charge top dollar you have to over deliver and if the client can’t afford you or is not willing to invest then it is important to make a decision if you want to move on or not. You can get a Web site built for free or on the cheap, but if you invest cheap that is what you will get. That’s business! A Web presence is an investment and should be treated as such just like building an office building or a skyscraper. First of all the client has to be serious about their goal or they are wasting your time secondly a Web site is a part of an overall marketing campaign. A good Web designer is able to write code, copy, databases and print marketing material as well. If they can’t do that then they should know where to outsource the work to a professional that can meet the clients needs. Also, original keyword focused content is not cheap, it takes brainstorming, planning, editing and proofreading. A good developer can charge whatever they want if they can produce a high return on investment. How would you feel if you built a Web site for $2,000 and your client sold the site for $200,000 or more? It has happened! A Web site is not a “get rich quick scheme” it takes time, patience and a lot of hard work that most people do not have the skill or patience to do. If you are a good negotiator you can ask for and get what you want. There are a lot of crappy Web sites out there because people get them on the cheap. People can tell before they read a word that the Web site is cheap and that’s the way that they look at your company as cheap. Typically you only get one shot because once someone goes to your site and see that you don’t care enough to do your very best it only takes a second for them to click over to your competition and they usually never come back. Your online reputation is too important to be cheap. In developing country the price is always low and the developer most of the time dont get the exact payment. But still freelancing web design is one of the most promising and profitable job. Thought it wou’ndlt to give it a shot. I was right. 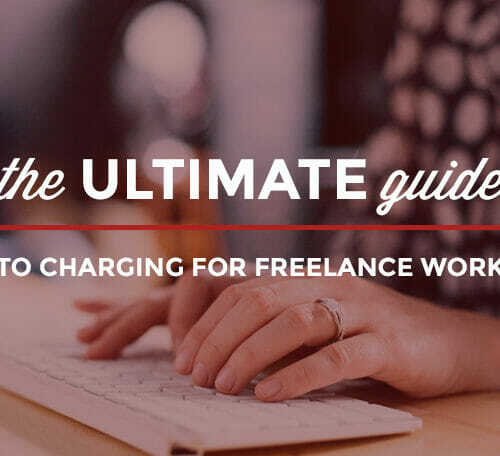 How Much Should You Charge for Freelance Web Design? 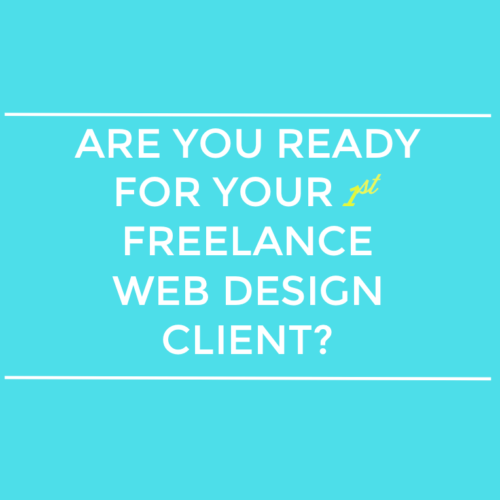 Are You Ready to Be a Web Designer? A Checklist. Want more articles like this? Sign up to get the most recent tech news, tips and career advice. Tech 101: What is Digital Marketing? Check out the FAQs, or email us at hello@skillcrush.com. © 2012 - 2019 Skillcrush, Inc. All Rights Reserved. Wondering if tech is right for you? Take our free, 3-minute quiz to find out. 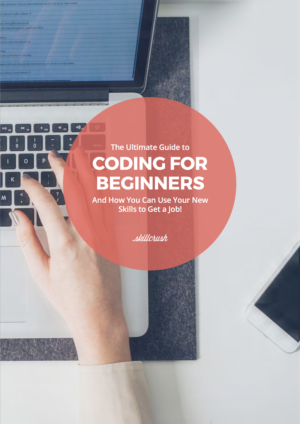 Learn how to code & how to use your skills to get a new job in this FREE, 60+ page ebook!